The requirements for the marking of plastic parts is increasing still further. In addition to date and batch identification, information on food safety, recyclability and CE marking is becoming increasingly important. Companies in the toolmaking, jigs and fixtures, and mechanical engineering industries like to make use of semi-finished products in precision flat steel. HASCO has extended its product range of ready-to-install single needle valves with the H44201/… and H44202/… hot halves. Users will benefit first and foremost from the high efficiency and safety of the system. 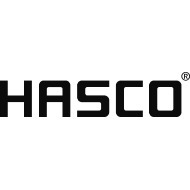 HASCO is extending its hot runner product portfolio with an innovative generation of control units in the H1280/… series. This controller is noted for its high functionality and comprehensive diagnostics and sets new standards in ease of operation. Flat ejectors are used in critical areas of injection moulds, such as ribs and flanges. Positive locking cylinders are used in injection moulds to operate valves, cores and similar components. HASCO supplies a comprehensive range of hoses in many different materials for the various applications in the construction of injection moulds. The HASCO Hot Half H4400/… is a fully tested and proven all-in package which ensures that users are always on the safe side. With the aim of making production more efficient, increasing use is being made of stack moulds – and not only in cases where production space is limited. Through the continuous further development of its product portfolio, HASCO, the Lüdenscheid/Germany-based specialist for standard mould units, is able to provide mould-makers with new possibilities for working more efficiently. As a strong, leading international supplier of modular standard components and accessories, HASCO is constantly working on new solutions for mould-makers. The new, fully assembled and wired hot runner systems H4016/... supplement HASCO’s extensive range of ready-to-install systems and hot halves. Thanks to HASCO, elaborate deep-hole bores and high pressure losses caused by 90° cross drilling are now a thing of the past. Precise guidance of the mould halves is essential for the production of high-quality injection moulded parts. Speed is an important factor in injection moulding production. Processes need to be kept as simple and efficient as possible. And orderliness and a rapid overview of available moulds is a key aspect of this. HASCO has now extended the company's own nozzle range by the particularly high-performance and highly efficient Vario Shot nozzle series. HASCO’s Clever Mold System in conjunction with the innovative small series mould saves time and cost in mould and toolmaking.